MPI stands for Max Papis Innovations and was founded 2009 by Max Papis and Tatiana Fittipaldi Papis, in Mooresville,NC. Max Is currently the European driver with most NASCAR starts and has driven and worked in almost all forms of the motor racing; Karting, F1, CART, Indycar, NASCAR, Sports-Car, among others. All MPI wheels are designed and engineered in the USA and built in Italy using the latest steering wheel technology and state of the art materials. MPI prides itself on several wins in CUP, NW, Truck, Late Models, Legends and local races. In 2014, MPI won its first NASCR Sprint Cup Series Championship with Kevin Harvick and Stewart Haas Racing, as well as its first Xfinity Series Championship with Chase Elliott and JR Motorsports. 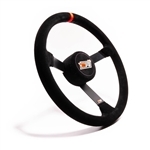 The ultimate bandolero/legends steering wheel is here, MPI manufactures an aluminum structure, lightweight wheel. 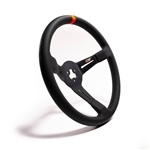 MPI Oval Steering Wheel, Ergonomicgrip, 14" O.D. 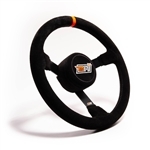 The industries lightest stock car steering wheel made with steel construction and an oval, ergonomic grip with thumb inserts. MPI has designed a new carbon fiber switch holder so you can avoid putting holes in your spokes. MPI has designed this late model/stock car steel wheel with the budget friendly racer in mind. MPI DM-15-A Dirt Late Model/Modified/Big Block Aluminum Steering Wheel 15"